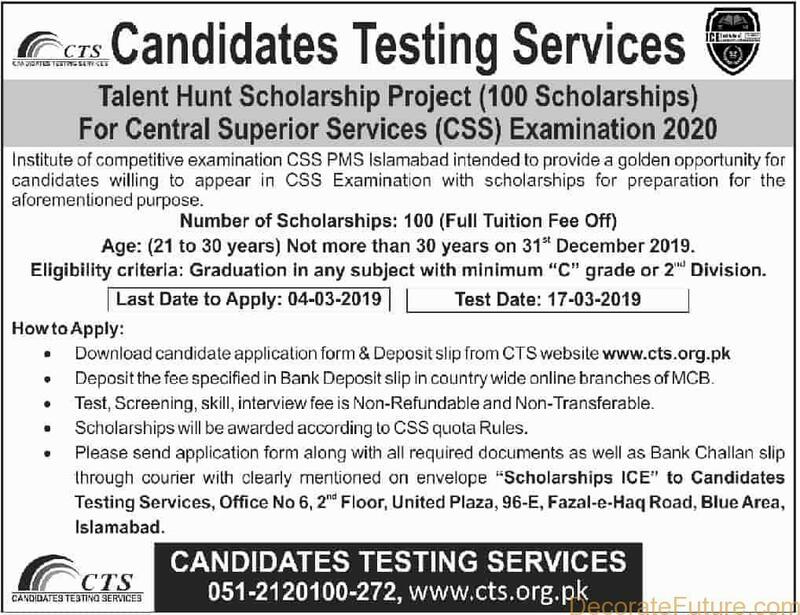 Applications are invited for Central Superior Services CSS Talent Hunt Scholarship for the year 2019 and 2020 from Pakistani citizens. Institute of competitive examination CSS PMS Islamabad Intended to provide a golden opportunity candidates willing to appear in CSS Examination with scholarships. The CSS Talent Hunt Scholarship will cover full fee for CSS examination, and the test will be through candidates Testing service. Deposit the fee specified in Bank Deposit slip in countrywide online branches of MCB. Test, Screening, skill, interview fee is Non-Refundable and Non-Transferable. Scholarships will be awarded according to CSS quota Rules. Please send application form along with all required documents as well as Bank Challan slip through courier with clearly mentioned on envelope “Scholarships ICE” to Candidates Testing Services, Office No 6, 2nd Floor, United Plaza, 96-E, Fazal-e-Haq Road, Blue Area, Islamabad.